Nature is a marvel that unravels in so many forms. It makes you lose yourself in the free spirit of the waterfalls, it makes you stand for hours together in awe of a beautiful sunset, it captures your senses and intoxicates you with it lush green valleys, it makes you wonder about the super sculptor up there when you reach the pinnacle of a cliff who crafted objects of wonderment and coloured the roof so often in a day with amazing shades. KokanKada is a jewel of India’s scenic beauty. Situated at Harishchandragad at the top of Malshej ghat, the cliff is unique in its shape that sharply resembles a cobra’s hood. It is evenly blessed with greenery and while it faces the west, the Kokan can be viewed from atop. It has mesmerized admirers of nature and layman alike and is easily one of the places everyone should visit once. 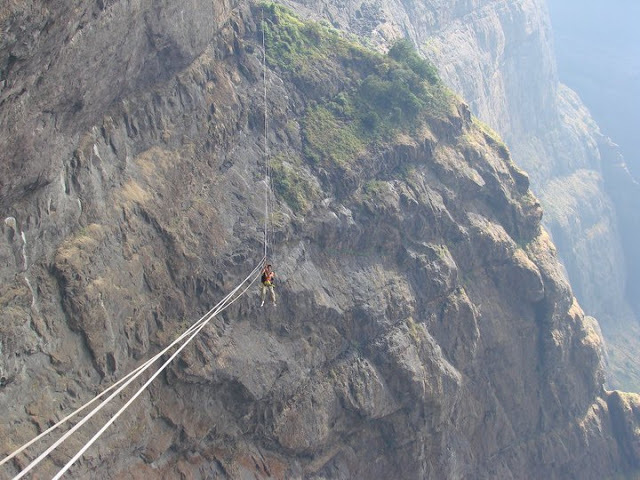 In order to make the visit to this special attraction fulfilling and orderly, we have arranged a grand event of Zip Line/Valley Crossing (1200 ft) and rappelling (1200 ft). We shall conduct the event with best of professionals and equipments in this field (conducting the event every year since 2004) . The professionals will not only guide but also present an experience that you will take with you and remember for the rest of your lives. When you think of Kokankada-the words adventure, thrill, beauty, amazement come to your mind. When you think of Kokankada with Backpack Holidays-you will be left with only two-unforgettable experience packed away with loads of wonderful memories. Come, submit yourself to this amazing jewel of nature. It is one of the finest creations by the craftsman up there-waiting to be visited by you! 1. Call up Dimesh - 9892974968 or email at backpackholidays@gmail.com and inform the batch you want to book your seat in. 2. Transfer online Rs. 200 per person (Non refundable) into below mentioned account to secure your seat. Final amount will be declared in October. Last year the fees was Rs. 2950. This year it shall be +/- 200.